For my Capstone project I need to interview someone that is a expert on my topic, Giant pandas. Finding someone to interview was one of the hardest things about my project Capstone. I asked my teacher for some help because I had no idea who I was going to interview. My teacher contacted two different people who knew a lot about pandas, but unfortunately none of them answered. I was getting really frustrated because I didn’t have a interview and almost all of my classmates already had someone to interview. I told my mom to help me find someone to interview because I was getting really stressed out. My mom and I contacted six different people. One hour later Dr. Megan Owen answered and said that she could do the interview. I was so happy that Dr. Megan Owen replayed so quickly. Someone else replied and I didn’t know if I was going to interview two different people, I then decided that I was not going to interview two different people because it would be very complicated. What attracted you to your field of work? What do you love best about Giant pandas? How have humans affected Giant pandas? What is being done to improve Giant pandas’ lives and their future? What are the pros and cons of Giant pandas living in the wild? Do habitats in zoos match Giant pandas’ real habitats? For example, if a Giant panda is pregnant in a zoo, what is done to make the birth successful? Do pandas act/feel differently inside zoos than outside? Can you measure how happy they are? 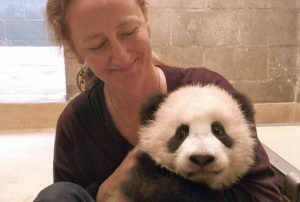 Are humans mostly hurting or helping Giant pandas? Who/what is the biggest threat to Giant pandas? Do you think Giant pandas are going to become extinct in the future? How are you helping the Giant panda? When I had all my interview questions I asked my teacher to read my questions and see if they were appropriate. I emailed my interview questions to Dr. Megan Owen, two days passed and she answered my questions. Dr. Megan Owen was so helpful and so nice. She explained her job and how she helps the Giant pandas. She told me all about how humans are hurting the Giant pandas and all about Giant pandas lives in zoos. I could tell that you put a lot of thought into this post! I loved your details and your pictures! Great Job! Adding the picture to your post is a nice touch because it allows me to picture Dr. Owen. What did you actually learn, exactly, as a result of your interview?